David MacKay is a physicist but not a climate scientist. He is the author of the book Sustainable energy – without the hot air, which examines the daunting challenge that the United Kingdom faces in decarbonizing its energy supply. It’s a must-read, entertainingly written, easy-to-understand work, and can be downloaded for free. MacKay was appointed in 2009 to be Chief Scientist at Britain’s Department of Energy and Climate Change. His letter to Ridley raises points that will be familiar to regular readers of Skeptical Science; he cites recent evidence of climate change and discusses the analogue of the Paleocene-Eocene Thermal Maximum and the central question of the likely range of climate sensitivity. MacKay also mentions that his personal and professional contact with climate scientists bears no relation to the way they are often negatively depicted on contrarian blogs. Warming Island. See Andrew Revkin’s Dot Earth article for a good review and anSkS blogpost. Speleothem temperature records (from Watts Up With That). A rough and ready analysis by Willis Eschenbach that shows that some temperatures over the past 10,000 years were hotter than today. Whether reliable or not, these results are consistent with mainstream science, as reported by the IPCC AR4. GISP2 curve (from JoNova). Thoroughly debunked by Gareth Renowden. Temperatures sometimes increased faster than now during the last glacial period.Indeed regional temperatures did increase very rapidly during ice-age Dansgaard-Oescher events, probably due to sudden changes in North Atlantic circulation. D-Oevents have little relevance for the predominantly CO2-driven global warming we are experiencing now during an inter-glacial period, except perhaps that they provide examples of how small changes in external forcings can sometimes lead to intenseregional climate changes. Twentieth century temperature increases are caused by adjustments made to instrumental records (WUWT). Debunked by Fall et al. (2011) and the BEST project. CO2 lags temperature in the Vostok ice core record. Discussed here. The time lag in the ice cores is a feature, not a bug; see Spencer Weart’s History of Global Warming. The Milankovitch hypothesis fails quantitatively unless orbital changes provoke major positive feedbacks. Two degrees won’t be bad. Let’s hope so and let’s hope also that two degrees is all we get; discussed here. National Geographic video. Roy Spencer. Roy Spencer’s Great Blunder. Roy Spencer on Climate Sensitivity. The hockey stick is an artifact. Here and here. Previous forecasts of other environmental catastrophes have been wrong. Left as an exercise for the reader. Ridley alleges that scientists and bodies like the Royal Society (MacKay is a Fellow) have been complicit in not putting a brake on “politically-inspired extreme statements”. The article in question, containing the supposed “extreme statement”, is a Nature Commentary article discussing relative contributions of short-lived atmospheric pollutants (black carbon, methane, ozone, nitrous oxide, etc. ), aerosols, and longer-lived carbon dioxide. The paper is entirely concerned with the climate in the twenty-first century, so the authors’ supposed failing to address all aspects of climatic volatility over 4 billion years is not evidence of politically-inspired extremism but is instead utterly irrelevant. Moreover, the global climate had been relatively stable over a period of ~8,000 years, until humans began burning large quantities of fossil fuels. Carbon emissions not the main cause of warming in the PETM? ZZC 2010 used ocean chemistry (carbonate dissolution accounting) to constrain estimates of the magnitude of the initial carbon pulse at the PETM to less than 3000 PgC (3000 billion tonnes of carbon). Assuming a baseline atmospheric concentration of CO2 of 1000 ppm, this would result in a concentration of 1700 ppm, less than a doubling. 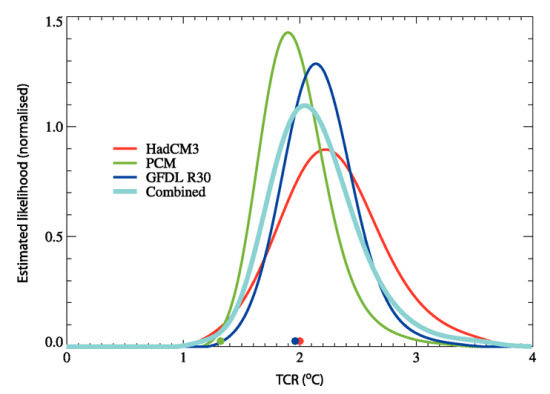 Using a maximum climate sensitivity of 4.5 yields a temperature increase of less than 3.5°C, far less than the estimated range of 5-9°C for the PETM. 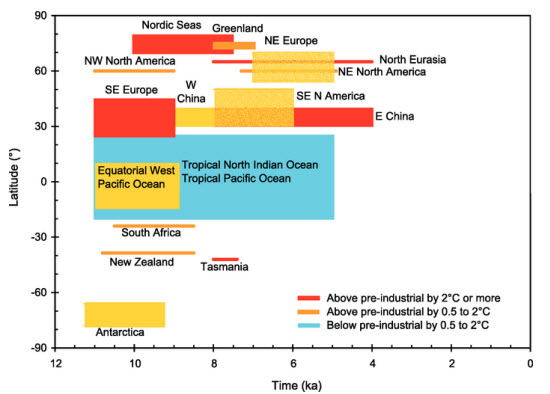 Zeebe et al conclude that unknown “feedbacks and/or forcings other than atmospheric CO2 caused a major portion of the PETM warming”. ZZC 2010’s estimates are at the low end of many other estimates; for example, Panchuk et al (2008) also use carbonate dissolution methods to arrive at a minimum 6800 PgC release. ZZC 2010’s results point to unknown effects that further amplify a sudden carbon release. They speculate that one possible cause is the release of trace greenhouse gases, such as methane, caused by the warming that came as a consequence of the initial carbon influx. He “knows” that the IPCC estimates are “utterly worthless”; there’s not much equivocation there. It’s important to note that the IPCC does not “assume” a net positivefeedback; rather, this is the result generated by every single climate model. And while the cloud feedback could hypothetically offset all positive feedbacks, there is no indication that it actually will. Elsewhere in the post, Ridley says he has “no idea” what the climate sensitivity range is but then says: “It could be 1C or lower, it could be 3C, but I think it very unlikely from the latest data that it is going to be as high as 4.5C.” But he neglects to point us to a reference for the “latest data”. Perhaps he is referring to recent global temperature measurements, but without considering the thermal inertia of the deep oceans, asLindzen and Monckton have done. The IPCC’s transient climate sensitivity, defined as the non-equilibrium global temperature change achieved quickly during an idealized CO2 doubling scenario, is exactly the same range as Ridley’s. I have presented arguments and examples of Matt Ridley reading into scientific papers only those conclusions that bolster his skepticism about the potential seriousness ofclimate change. Meanwhile, he ignores the context and conclusions in those same papers that offer his viewpoint no support at all. Also, he quotes blog scientists and other non-specialists as if their opinions were authoritative. It’s hard to imagine in his writings on evolution and genetics that he would ever quote a climate scientist, say, Roy Spencer, as a useful guide to The Evolution Crisis. In his earlier books, Ridley mostly avoided the pitfall of the Naturalistic Fallacy, in which a natural is is confused with an ethical ought. Many other people who have written about evolution and the nature/nurture debate have not been as fastidious, drawing unwarranted political, ethical, or even spiritual lessons from biology. In contrast, when it comes to climate, Ridley seems to fall prey to a kind of reverse naturalistic fallacy, in which his political and ethical worldviews influence the particular scientific results he chooses to accept as reliable.